Firenze Romana - FLORENCE LIVE! 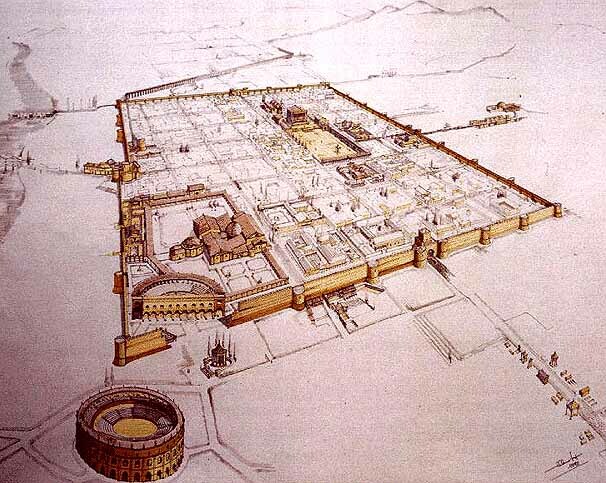 Nearly 1800m of brick, city walls, with cylindrical watch towers placed at regular intervals, created the boundaries of the rectangular "castrum" within the centuriazione. The walls connected four turretted doors and were designed around the concept of two main axes (marked above in green). These two axes intersected at a right angle in the center of the settlement--the location of the main town square (the "forum urbis") the Piazza della Repubblica of today. 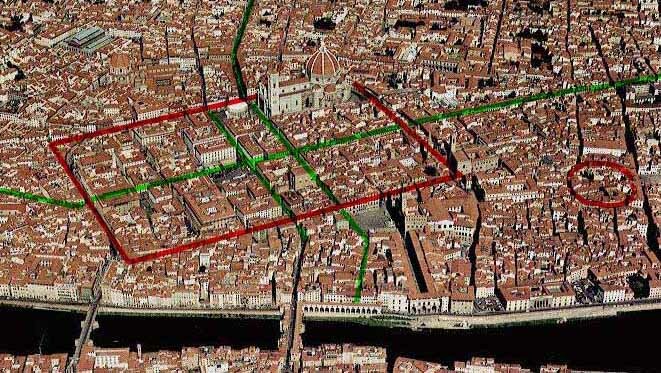 The third green line above, which passes directly in front of the Duomo and stops at the river, indicates the course of an ancient route which ran through the city to a ferryboat on the Arno. This system was a necessity until the building of the Ponte Vecchio joining the two banks. A subsequent period of improvement and expansion of Caesar's empire saw the constrution of the Theater (150 A.D.) in the area which is today the back side of the Palazzo Vecchio, as well as that of the Amphitheater (between 124-130 A.D) indicated with a red circle at right in the photo above. The completion of the community's sewer system, wells (many of which were in use through the 19th century), aqueduct, baths and river port, as well as a bridge over the Arno, also took place during this period.